2013 - Conversations Électriques At La Panacée, Montpellier. Polyphonea is based on the idea of producing a unique performance space, where music can evolve through both space and time. It provides various acoustic volumes in such a way that the listener is able to experience the music very differently on the bases where he or she is positioned. The idea is that listeners move continuously. Here the movement of the body wakes up a different dimension in the physical process of listening. The installation consists of a system of 32 speakers and 16 channel sound processors. 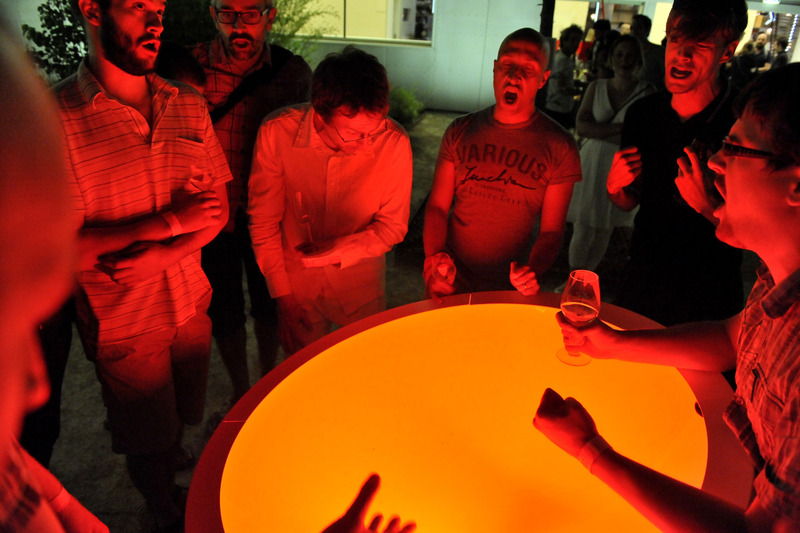 The interface to the piece are two sound ponds, spherical dish-formed 1.2 meter diameter objects that are fitted with microphone and light. The installation has three levels, live professional performance, replayed recording and as an open podium. Within the Polyphonea project italian composer Giovanni Bonato has been commissioned for a new musical piece, for which he wrote a suite for cello and male voices entitled “Portrait de dame”. Performed by Vokalna Akademija Ljubljana and conducted by Stojan Kuret. 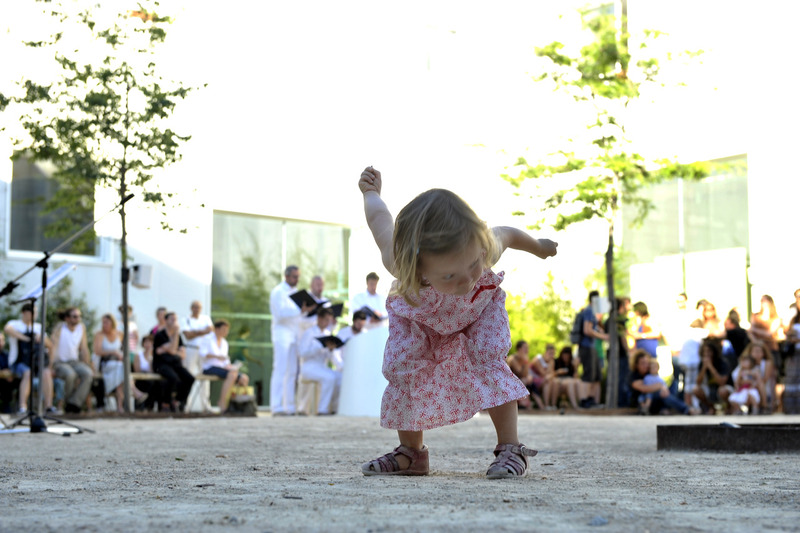 It premieres on June 22, 2013 as part of the opening of the new Art Center. A recording of the piece will be replayed at chosen moments in day, in the mean while Polyphonea will be open to the visitors. They will be free to render its spaces through their own voice. 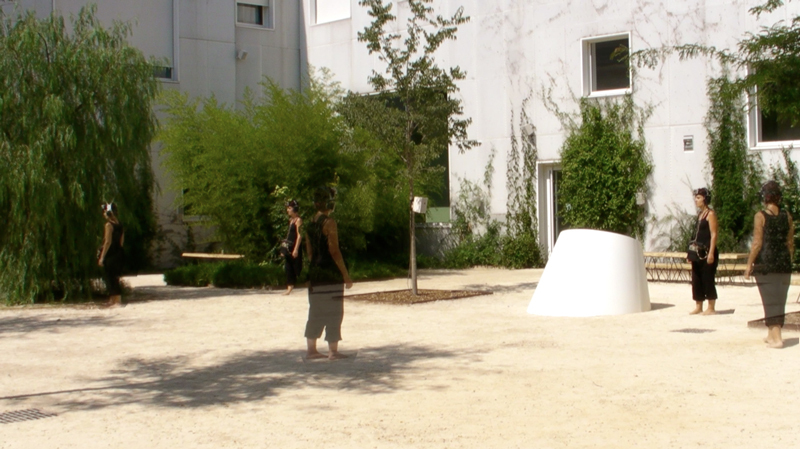 The installation was first exhibited at the new Art Center La Panacée (Montpellier, France) who commissioned the piece for its 25 by 25 meter open-air atrium. Premiere of Polyphonea at La Panacee.